DNC chairwoman Debbie Wasserman-Schultz struggled yesterday to explain why President Obama shouldn’t be held responsible for people losing their jobs at Solyndra while Mitt Romney should for job losses at companies Bain Capital invested in while he was CEO. Wallace: Is the president responsible for laying off the people at Solyndra? Wallace: Well, Romney wasn’t the CEO of these companies either. Wallace: The president was—excuse me—the president was a venture capitalist. He put taxpayer money into Solyndra and a thousand people lost their jobs. So is the president responsible for the thousand people who lost their jobs at Solyndra? Wallace: He wasn’t the CEO, he put money into them. Wallace: Well the president’s the CEO of the country. Wallace: And Romney wasn’t the CEO of Ampad or these other companies. Wallace: So you’re saying the president has no responsibility for what happened at Solyndra? Wallace: I’m asking about the president. Wallace: Has no responsibility for Solyndra. Wallace: And how about the company, Solyndra, that went bankrupt? Wallace: Well, I think you did answer the question. It’s not apples and oranges. It’s a typical Democrat double standard: Romney doesn’t have to be the actual CEO at companies Bain Capital invested in to be held responsible for any layoffs or closures at those companies, yet Obama, as U.S. President, gets a pass from being held accountable for the layoffs at taxpayer-subsidized Solyndra. 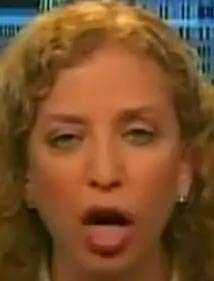 Wasserman- Schultz answered Wallace’s question all right. Now the question is, how long will it take the Democrats to recover from her answer.